Shot put underway during our October 2017 festival at McLeod Park in Langley, BC. All festivals will be held at McLeod Athletic Park in Langley, B.C. Flights and schedules are announced the week prior on this website and our Facebook page. Surrey, BC - It was the perfect ending for a very successful year! The inaugural awards banquet of the throwing club, Ultra Throw was a huge success. 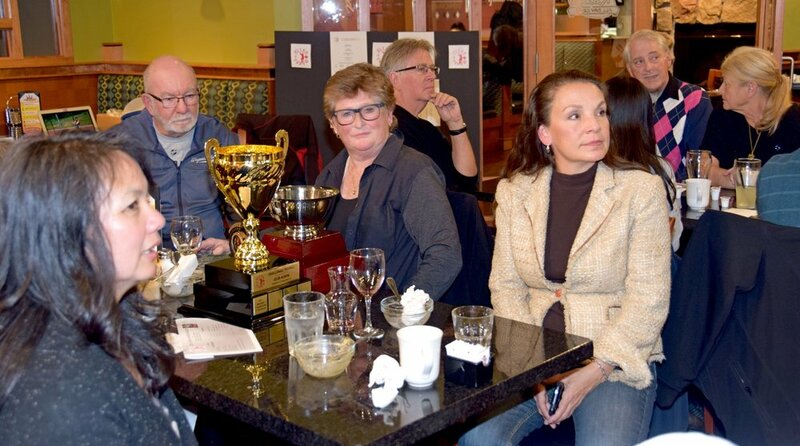 Members of the two year old club, along with guests, meet officials and sponsors gathered at Ricky's All Day Grill in Surrey on November 4, 2017 to enjoy a buffet dinner, camaraderie, and a brief presentation of awards and honours. After the feast, Ultra’s newest hardware became the center of attention. Thanks to a sponsorship from Harnek Toor (member), Gurinder Toor (Alpha House Mortgage Corporation) and Alan Utting (AK Designer Home Improvements Ltd.), there were three perpetual trophies to hand out. Taking home two of the new trophies, was BC Masters athlete, Rose Hare. Rose won the ‘Challenge Trophy’ (aggregate throws pentathlon point total for Ultra Throw Festivals (#1 - #3) and the ‘Ultra Cup’ (single highest throws pentathlon points scored in Ultra Throw Festivals (#1 – 3). The Ultra ‘Ambassador of the Year’ went to Harnek Toor for his extraordinary contributions of displaying all the positive qualities in character, integrity and deeds towards the promotion of Ultra Throw and the throwing community. In addition to the three perpetual trophies, a ‘Sponsor of the Year’ plaque was presented to Gurinder Toor from Alpha House Mortgage Corporation for his generous donations this year and last. The complete list of performances and awards can be found HERE. After the awards presentations, conversations revolved on reminiscing about the year’s past accomplishments, new friendships were made and common interests were shared. The perfect end to an enjoyable evening. The Ultra Throw season has come to an end, now it's time to rest, relax and recoup for the start of Ultra’s next season starting in the spring. During the off season, Ultra’s directors will put together the framework for a successful 2018. This year's directors are: Dave McDonald (President), John Hodgson (Vice President), Carolyn McKinley (Treasurer), Robbin Whachell (Media/PR) and Rose Hare (Registrar). As this was the very first awards banquet for the Club, mention of all those present is pertinent. All those in attendance were: Dave McDonald, Carolyn McKinley, Derek McKinley, Rae Vezina, Celina Wong, Yoshiko and John Hodgson, Al and Lori Graham, Frances Steinfield, Rose and David Hare, Owen and Leona Wong, Harnek Toor, Ramon Toor, Alan and Alex Utting, Robbin Whachell, Gabriella Moro, Dave and Sarah Ulis, Mohan Bains, Betsy and Jim Rollins, and Ron Heron. For more photos, check out our Facebook album HERE. ‘Ambassador of the Year’ went to Harnek Toor, presented by Club president Dave McDonald. We are pleased to announce our upcoming Ultra Throw Festival to be held on March 19th from 8am to 5pm at the South Surrey Athletics Park. NOTE: The first 3 attempts in each event are the ones used to determine the scores in the Throws Triathlon and the Throws Pentathlon. If an individual is registered for both; the first 3 throws will be scored for the Throws Pentathlon and the final 3 throws will be scored for the Throws Triathlon. We run a floating schedule; events may run ahead of schedule and athletes should be prepared to compete in their next event 45 minutes ahead of the scheduled start time. Organizers will supply implements; however, participants can weight-in their personal implements at 8 am. Selection to Flight 1 or 2 will be done after entries are closed. Flight lists will be available on Ultra Throw website (ultrathrow.com) on Saturday, March 18th, 2017. Three Ultra Throw members traveled to Perth, Australia in October 2016 to compete at the 22nd World Masters Athletics Track and Field Championships. Scot Henney won 5 of the 20 total medals for Canada at the Championships. Gold for the weight throw and the weight pentathlon, silver for the hammer, and bronze for the shot put and the javelin (he placed 4th in the discus). Not bad for taking up the sport at 89 years of age (two years ago)! Frances Steinfeld had top 8 finishes in all the events she entered (she passed on the javelin). Frances placed 6th in the shot put, 7th in the weight throw, hammer and the weight pentathlon, and 8th in the discus. Dave McDonald placed 5th in the hammer, 6th in the javelin, 9th in the weight throw, 16th in the shot put and 17th in the discus. He did not finish the weight pentathlon. "It was quite the experience for us all," said Dave McDonald. "The structure and formality of the events will be remembered by me for a long time. The biggest 'bring back' from the games will definitely be the interactions with all the competitors in every event and within the championships. I have said it before: 'throwers are the best!' "
Click HERE to see photos of Scot Henney competing in Perth.